How Professional Web Designers Can Help You? Top 5 Reasons? In today’s competitive business scenario, it has become imperative for any business to have a professional website. The Internet has become the source of information for people from all walks of life. Without a digital presence, a business simply cannot survive in the modern day. Today, if you want to create your own website, there are abundant site builders in the market to help you do the same. Why does one need a professional then? Can a DIY (Do It Yourself) site builder used to create a website, replace the acumen of a professional website design company? 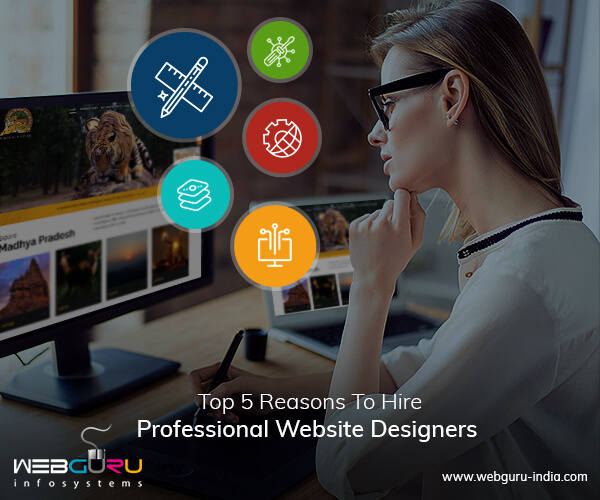 Let’s find out the top 5 reasons to hire a web design agency to help launch your business on the internet. An experienced website design agency will assess the needs, goals and marketing objectives of your business and incorporate those while designing your website. Any design, along with the content should match the tone of the message you are trying to convey. Your call to action should also come out clearly through your design. Do you want online sales or would you want your site to be a place to connect with your audience? All this and more can be conveyed to the designers, content writers and marketing experts of a website design company, who will blend those into your design. DIY site builders limit the capabilities of a site in terms of graphics, texts, colors and don’t let you tailor your site to be a perfect fit for your business. The website usability or, in other words, User Experience is the most important aspect of a website design. You have designed your website, to have customers navigate their way easily to useful information, without getting stuck at places. While the content of a website should be absolutely unique, the user navigability should be predictable and very simple for your visitor. An expert website designer will know how to best keep your brand’s tone intact. They will use colors, graphics and white spaces properly to create a smooth experience for your users. Your business will have a million competitors out there fighting to take the top spot. Each of them will have their presence on the World Wide Web. Making your website is just the first step. You need to be visible to your audience. To do so, your website should be fully optimized for the search engines and your aim should be to appear on the first page of the SERPs (Search Engine Results Page) . A proficient web design company, will not just tailor a website for you, but will also totally optimize the site, in areas of content, page load speed, responsiveness and more. Otherwise, your whole endeavor becomes a waste. It is true that developing a website is a one-time job. Any site builder can help you do that. But, maintaining its performance by constant monitoring requires a dedicated team of proficient web designers and developers. The website development platforms like WordPress, Magento, Joomla, PHP and etc, release new versions every now and then with advanced security and performance features. It is imperative to keep the platform updated to take advantage of all these latest features. Also, you should keep a backup of your website in case anything adverse happens and, you lose your site completely. A professional website design and development company will take care of all these quite conveniently. Although it is difficult to choose the right website design company that ensures a seamless web presence, there are some that meet your expectations with their knowledge, hard work, and diligence. While choosing a company to help build your brand, look at their services, their portfolio and choose one that provides holistic services, in terms of design, development, optimization, and maintenance. After all, your website is a reflection of your brand. So, make it look flawless and perform the best! Hi, Nice post. keep up writing. Nice and Informative Blog !! Nice and Informative. Good Article. It’s really great and informative blog. Responsive web design adjusts content to a device’s screen. Google has always recommended responsive web design in india (RWD), especially after rolling out a big update on the 4/21/15 which ranked mobile-friendly sites higher.